Camp Bow Wow Named the Best of the Best! Have you heard? Our Pack has been named an honoree on the 2017 Best of the Best Franchise List by Entrepreneur! We’re pawsitively ecstatic about being selected by Entrepreneur as the 2017 Best of the Best Franchise in pet services. Not only are our tails wagging to add yet another accreditation to our collection, but we’re honored to be recognized as an elite franchise company that ranks in the top tier of the pet care industry by Franchise 500. What puts Camp Bow Wow a step above the rest? Camp Bow Wow is built for dogs by dog lovers! Our Camp owners are unbelievably passionate about caring for our furry friends. 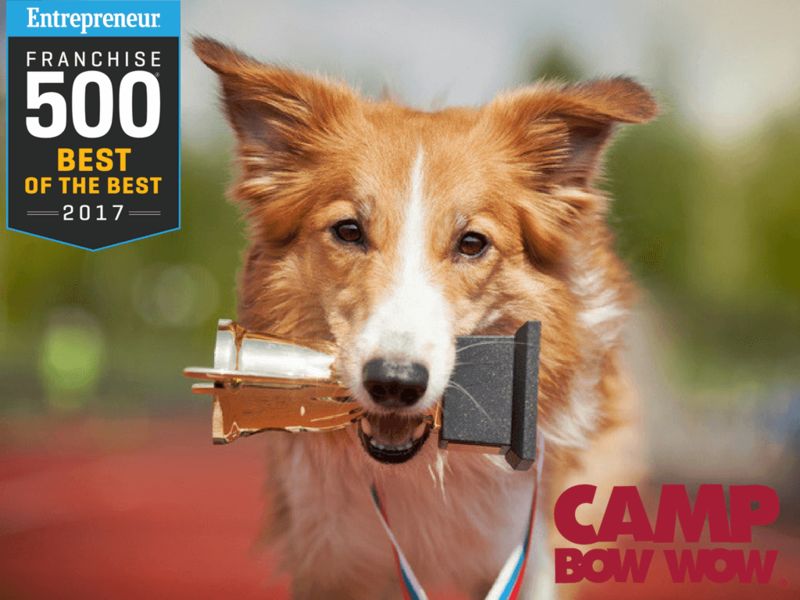 Founded in 2000 and franchising since 2003, Camp Bow Wow has experienced 17 years of growth and success, and counting. All of our Camps offer overnight boarding, as well as doggy day care services, and some offer behavioral training classes and at-home pet care through our Behavior Buddies and Home Buddies programs. Pet parents can even check-up on their pups via webcam from anywhere on their desktop or mobile device. Since we get to bring our dogs to work each and every day, we genuinely understand the separation anxiety and guilt pet parents feel when they have to put their dogs in day care or boarding for several days. This empathic school of thought is the secret to our success. Our obsession with man’s best friend drives everything from the state-of-the-art design of our boarding cabins and indoor-outdoor play yards to the checklist of daily duties that is hanging in every franchise owner’s Camp. Pups across the nation visited Camp Bow Wow over three million times last year, and it’s easy to see why. We’ve crafted a pet experience that you can’t get anywhere else, disrupting the traditional kennel model. Our approach to doggy day care and boarding re-imagines and re-invents pet services in ways that better align with our customers’ needs and desires. That’s why we’re the largest pet care franchise in North America! Are you a dog-lover yourself? Are you interested in providing a fun, safe, caring place for pet parents in your area to feel comfortable leaving their pup while they work and travel? If this sounds like you, we think you’re ready to join the Camp Bow Wow Pack! To receive your complimentary executive summary and learn more about franchise opportunities, fill out the form below or call us at (870) 600-2713.